Milking the Rhino is now available for free online streaming on PBS's video portal as part of the Global Voices Collection, through October 9. Watch it here. Milking the Rhino examines the deepening conflict between rural Africans and animals in the ever-shrinking African wilderness. In a new update on the project at ITVS, Milking the Rhino director David E. Simpson discusses what has happened to the past four years since the film was released. The community conservation efforts of the Il Ngwesi and Maasai tribes have allowed their tribes to withstand "the vicissitudes of economy, politics, population growth, and climate change," while the film itself has played on six continents and inspired an international competition to find new solutions to problems plaguing African indigenous communities called the Milking the Rhino Innovative Solutions Showcase. 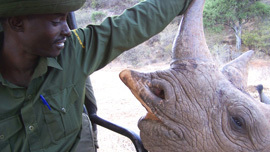 Watch Milking the Rhino on PBS. See more from Global Voices.